Say it, they say, with flowers. If your sweetie’s a gardener, with or without a green thumb, dahlia tubers make a perfect valentine. The gang at Lynch Creek Farm doesn’t ship tubers until it’s close to planting time, but they can come up with a creative way to let your loved one know you’re thinking of him or her, and looking ahead to spring. Their dahlia collections offer up a lush range of sweet colors and textures perfect for Valentine’s Day. Or make your own collection. Lynch Creek’s Andy and Nathanael especially like Danjo Doc and Audrey Grace (see photo). 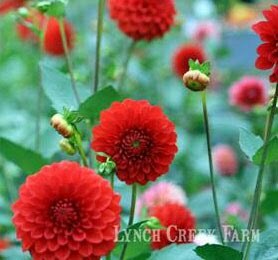 These two small dahlias, one dark and one light red, have tight, compact blooms that are great for cutting. Strong stems and crisp substance make them hold up well in bouquets. They’re attractive in the garden as well, perfect for mixed-flower borders. My personal favorites are the singles, semi-singles and collarettes. They show off beautifully in borders as well as providing abundant blooms for bouquets. Appleblossom, La Bomba and Double Trouble are all great performers in perfect colors for the occasion. Another sweet dahlia in seasonal colors is Colorado Classic, a soft blend of white and pinky-orchid that tips the petals. Colorado Classic is great in the garden or as a cut flower, with blooms up to six inches across, and incredibly strong, long stems. You can impress your Valentine now and your garden visitors this summer if you go for the showy “dinnerplate” dahlias, those monster flowers that make each blossom a bouquet. Bodacious is a farm favorite, bright red shading to yellow tips. Envy is a deep rosy red with great substance and presence. And despite its name, the burgundy-shaded Grand Finale should bring pleasure without end. Get creative; you can copy the photos from the Lynch Creek website to make your own card and let your honey see what’s coming. And if you’re unsure, gift certificates are always an option. There’s nothing like flowers to say “romance.” But here’s a bit of gratuitous advice: don’t forget to sweeten the valentine even more with a little bit of chocolate.